The enumeration districts for the City of Winnipeg in the 1911 Canada census contain no descriptions that would aid those looking for people at particular addresses. Below are the Winnipeg streets in each district, including those in outlying areas now included in the present city limits. Each enumeration district is linked to the relevant transcription page at AutomatedGenealogy.com. NOTE: This is a work in progress. Streets and buildings will be added as time permits. Thanks to Jim Blanchard, Andrew Cunningham, Jeanette Jerome, and Neil Pryce for help in correcting and expanding this list. Some street names in 1911 have changed. A list of 1911 and present names is given at the bottom of this page. The basis for some city street names is available here. Addresses for some enumerations list a building, not the actual street address. A list of addresses for apartments and buildings is given below. Further information about some buildings can be obtained from the City of Winnipeg property assessment web site. There is a corresponding index for the City of Brandon. No street addresses are given. The district includes part of River Heights, probably along Kenaston, consisting mostly of dairy farms. The only identifiable place is the Manitoba Agricultural College (notably its student dormitory), now site of the Asper Jewish Community Campus. 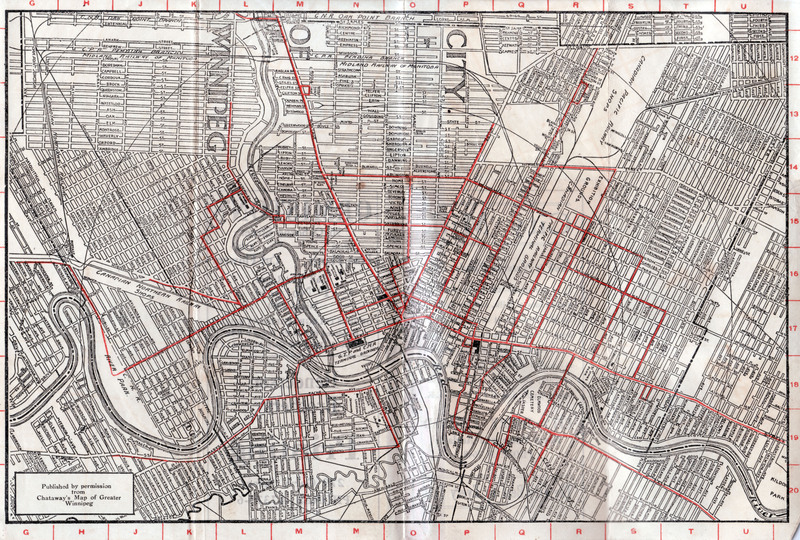 These maps are helpful in locating a particular part of the city in which a street is located and, when compared with modern maps, in deciphering changes in street names and locations. Each of the following maps is shown in a low-resolution version but a higher-resolution version can be downloaded by clicking on the map with the right mouse button and selecting “Save Target As...” (in PC Internet Explorer). Chataway’s Map of Greater Winnipeg, c1920 [2,345 KB] by C. C. Chataway. The following list was published in the 1911 Hendersons Directory for Winnipeg. In some cases, an address was given only as an intersection of two streets, in which case a more specific street address was obtained from the 1923 Hendersons Directory, given afterwards in square brackets. Links are to the enumeration pages where residents of a building can be found.